Five top tips to beat the burglars. With winter approaching the number of home burglaries increase with winter being the peak time for criminals to target your house. The combination of early nights providing cover and the need for quick cash before Christmas means homeowners need to be extra vigilant this time of year. 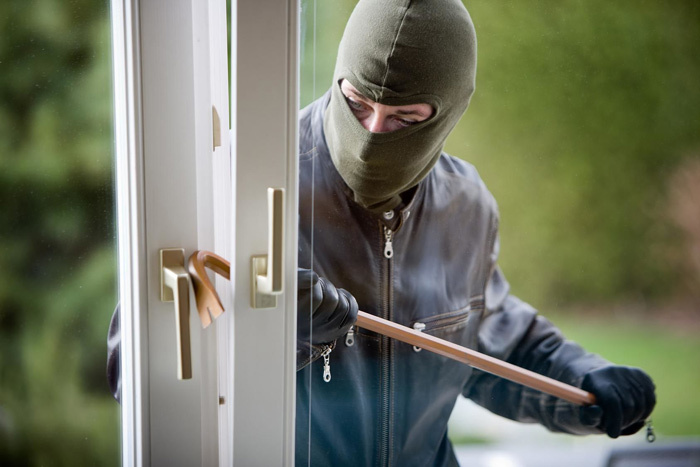 Burglars rely on the opportunity and will seize on brief lapses in security, spending around one minute attempting to gain entry and no more than five minutes inside the property. The best form of defence is to put measures in place which give a potential burglar every reason to walk right past your property. Here are our top five ways to keep the criminals away. In preparation for the winter, it is worth spending five minutes ensuring your insurances are up to date and will cover you in case of break-ins. For help finding the best-priced package for your needs, contact our Financial Services team on 0161 443 4555 for a free quote. 2. Toughen up your front door. A secure front door is a burglar’s worst enemy and gives them the impression that other entries to your house will be equally as tricky to get into. Doors and frames made of solid hardwood or metal are particularly effective and be sure to have a deadbolt lock fitted. Criminals love to window shop, so keep your curtains and blinds closed. If you have windows or glass panels by your front door make sure no keys or valuables can be seen, as the old trick of “fishing” with a piece of wire through the letterbox is still popular today. 3. Leave a light on. Early nights make it easy to see when a house is empty, marking it as a prime target. Close curtains put lamps on timers and leave a few lights on. The last thing a burglar wants is a confrontation with the owners, so is less likely to attempt to break in if unsure whether the house is unoccupied. Purchasing a good security system is a very wise investment. Many dummy alarms and cheap or broken devices are easy for an experienced criminal to spot, so buy one from a reputable name. Installing CCTV and external lights around the outside of your home is now relatively inexpensive and can act as an excellent deterrent. 5. Check what’s outside your property. The objects surrounding your property can often entice burglars. Place tools and garden furniture in a well-secured shed or garage to ensure that spades or forks cannot be used to prise open doors. Also, make sure any packaging from expensive Christmas presents are disposed of at a recycling centre or kept inside. Leaving them outside in plain sight advertises what high-value items are kept in your house.